I've upgraded the folio boxes for boudoir and beauty photos our Albuquerque studio. This tiny little Irish company started carrying these gorgeous handmade boxes that hold beautifully matted photos. They also have a little niche for your flash drive. Each box is carefully wrapped in a beautiful (and discreet) white box with a ribbon tied for elegance. Inside you'll find a beautiful grey nubuck faux suede folio box. 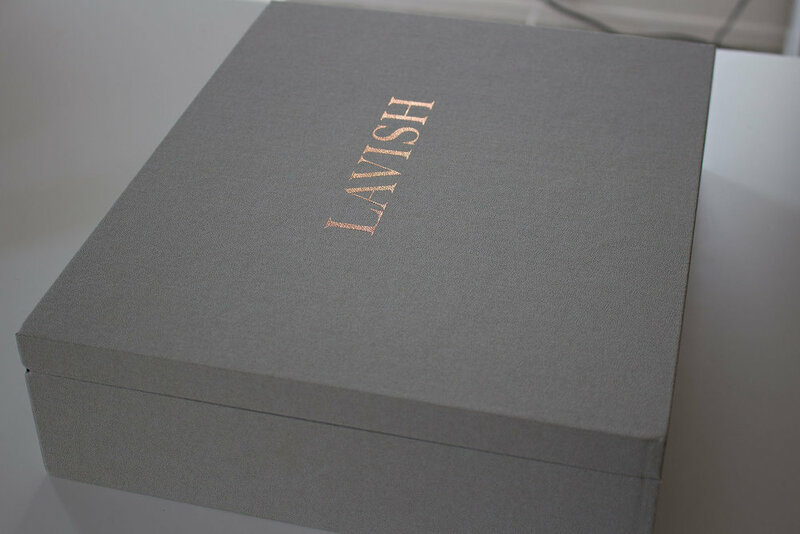 LAVISH is imprinted in rose gold foil. Nestled inside you'll find the gorgeous matted 7x10 prints. The perfect size to show of your beautiful photos. Then you might notice the pretty rose-gold-capped crystal hardrive embedded in the black velvet lining. This will hold your matching printable files for the smaller folio collections, or a complete set of photos for our Signature Collection purchases. Each drive is engraved with LAVISH for nostalgia and safekeeping. When you lift the pretty ribbon, you'll access all of your beautifully matted photos that are nested in the velvet-lined interior. Stash all of your boudoir and beauty photos for privacy, or take them out individually for framing, display or gifting. We hope that you love these new folio boxes as much as we do.